Cabinet doors are practically a magnet for sticky and unsightly grease stains, and it can be frustrating—and fruitless—to clean them without the proper supplies. Read on for three ways to tackle greasy residue. Kitchen cabinets, thanks to their close proximity to the stovetop, are natural hotspots for grease. Ideally, you’re cleaning your cabinet fronts at least every other week using a damp cloth followed by a dry one, but we’ve all had to deal with a layer that’s too tough to remove with a simple wipe-down. Fortunately, whether you’re trying to remove a fresh oil splatter from a batch of fries or years of caked-on residue in your newly purchased home, certain products have active ingredients that are more well-suited to cut through the grime than others. Here, we’ve detailed three highly effective cleansers in this guide for how to remove grease from kitchen cabinets. Note: All of these methods are safe to use on finished wood cabinetry, but always try them out in an inconspicuous spot before turning to larger areas to ensure they do not dull or discolor your cabinetry finish. Most types of kitchen cabinets can be cleaned with warm water and a few drops of dish soap, which has serious degreasing properties. Mix up a few drops of dish soap (not dishwasher detergent) in a bowl of warm water until soapy. Use a sponge dipped in the solution, but not dripping wet, to gently work the grease and grime out. Follow up with clean water to remove lingering dish soap, then dry the surface thoroughly with a dry microfiber rag. A natural degreaser, citrus oil can be just the thing you need to cut through layers of tough grime. Check your cleaning caddy (or the store, if you’re fresh out of supplies) for a multipurpose cleaner that contains citrus oil. Spray this onto the kitchen cabinets and let it sit for a few minutes. Then, use a sponge or microfiber cloth dampened with warm water to gently remove the grease. 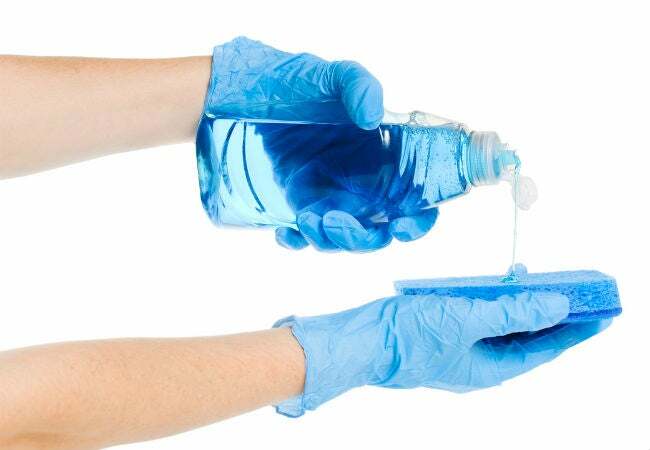 Wipe off any lingering cleaner with a clean damp cloth and dry thoroughly to finish. The same principle applies to homemade cleaners that contain the rinds of citrus fruit. 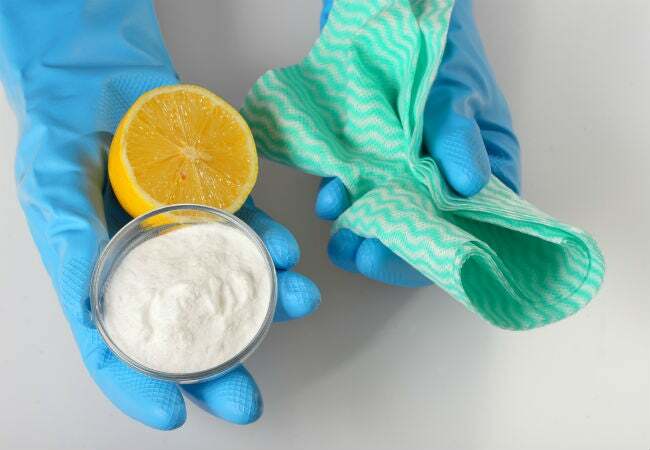 Whether you prefer all-natural cleaners or sticking to supplies you already have around the house, you can also make your own citrusy cleaning solution in just a few steps. Fill a canning jar three-quarters full of citrus peels and top it off with white vinegar. 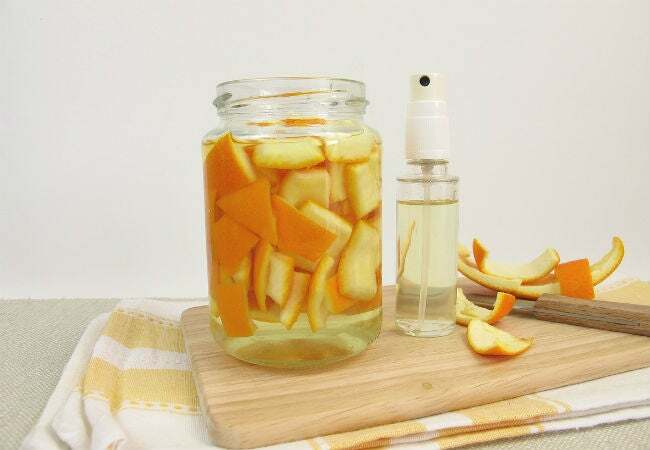 The mixture needs to steep for two to three weeks, but once it’s done just strain out the peels and pour the remaining liquid into a spray bottle. Apply the same way you would its commercial counterpart. For tougher jobs, a slightly more abrasive cleaner may be necessary. The grit of baking soda can do just the trick to dislodge grease particles clinging to the surface of the cabinets. And as a mild alkali, it is good for dissolving grease in water. Mix up a 50/50 combo of water and baking soda until you have a paste. Apply it to grease stains with a clean microfiber cloth using small, circular motions; swap out rags as they become too soiled, and continue until you have a grease-free surface. After you’ve covered all cabinet faces in the powdery paste, use a fresh damp cloth to remove excess paste and a dry cloth to remove the last of the moisture. 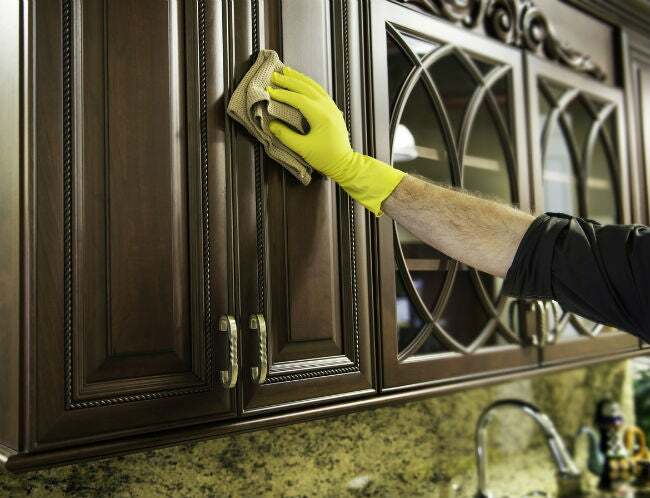 If you leave moisture behind, it can work its way into the finish of your cabinets and cause visible damage.